John’s love affair with all things Disney began at a very early age. He grew up watching the original Mickey Mouse Club on TV and always looked forward to Walt’s weekly shows. John’s first visit to Walt Disney World came in 1978 when he and his wife Cathy honeymooned in Orlando. This is when the obsession really began. John and Cathy returned to Walt Disney World so many times over the past 35+ years they have lost count. John would research each trip with painstaking detail, learning and absorbing all of the tips and tricks he could find. He gladly shared his knowledge and trip planning skills with friends and co-workers. 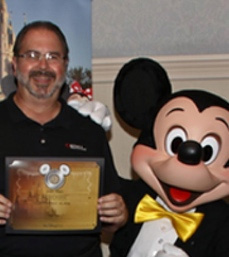 After spending 30+ years in customer service, John joined MEI and Mouse Fan Travel and now applies his customer service skills with his love of Disney trip planning to make clients dreams come true. Besides the many trips to Walt Disney World, John has been to Disneyland a few times and has taken many voyages on Disney Cruise line, Royal Caribbean Cruise line and has taken trips to Universal Studios Florida. John is a graduate of the College of Disney Knowledge and has attended multiple Agent Education Programs with Disney and Universal Studios. John continues his travel planning education by staying certified on all of the major cruise lines and travel partner web based training programs. John’s interests are photography, golf, and fishing and of course travel. Whether you are looking into an exciting Disney trip, a relaxing cruise or a romantic Caribbean vacation let John’s extensive knowledge help you make lasting memories!